So, the other night I was at a friends house and the Republican Presidential Candidates came up in conversation. Blah, blah, okay. I am proudly Democrat. I get very defensive when it comes to politics, like many of the people in our country, because of how binary it is. It's either you're this, or you're THIS! One is good, one is evil; one is this, one is that. Blah. I say that I'm proudly Democrat because in my opinion, how could I be a gay, feminist woman in our country and label myself as a Republican... when the majority of the arguments that I hear from Republicans are for the rich getting richer and for capitalism and pushing to take away any reproductive rights that a woman has? Anyway, Ron Paul came up in the discussion, and my friend said that he is okay with gays getting married. I'm all like, HUH? Really? Because I thought he was against equal marriage rights. This shows how misinformed someone can be, so I decided to do my research. While researching this morning, I went to the source, Ron Paul's Presidential Campaign Website. There's a tab labeled The Issues, and under that are topics of interest like the economy, the second amendment, abortion, healthcare and... wait, what's missing? Gay marriage. Interesting isn't it? Equal rights for gays is a MAJOR topic in our culture and government right now, but Ron Paul's campaign decides to leave that off of The Issues section? Why do you think that is? I Googled a bit more and decided, after some thought, to click on his Wikipedia page. Forgive me, I was having trouble finding a clear answer on the 'gay thing'. So, Ron Paul is known for being very conservative personally, but fighting against FEDERAL laws banning things; he'd rather leave those decisions up to the states to decide. In regards to DADT, Ron Paul has said that if something bad is happening because of a gay person then the specific person should be kicked out but otherwise be equally allowed to serve, and that if something bad happened with someone who was straight he would want them out of the military, as well. In case you didn't know, I love Jezebel. They recently wrote an article about Ron Paul and said that he couldn't even shake a gay person's hand.. he was uncomfortable. So I went to the article that they cited as their source, naturally. This brought me to Right Wing News, yay. Eric Dondero writes that Ron isn't a bigot, isn't racist and could possibly be a homophobe. Wait, what? He's explained that any person--fetus or .. person, should be entitled to equal rights. He says that it doesn't matter if someone is gay or straight, we should all have the same rights. Okay, I like that Ron, but.. I'm not with you on this abortion thing. In the video above, he explains that all life should be treasured, the classic anti-choice argument. What if I was 15, got pregnant and wanted to treasure MY OWN life? Your political party pushed to make it so that I'd have to have parental consent to get the morning after pill, or to even get an abortion. His argument is to persuade women to choose adoption, because you know there are so many children in America being adopted. I'll give this to Ron Paul, though, he is a republican candidate that you don't see very often. But (!) this abortion, anti-choice, pro-life crap is what's irritating me the most. Also, Ron Paul, you are SUPER sneaky with your homophobic ideas, I read your little letter from 2004, and NOW I know your sneaky tactics. Screw you! Another thing I noticed about his website is that he doesn't have a death penalty or a war section. 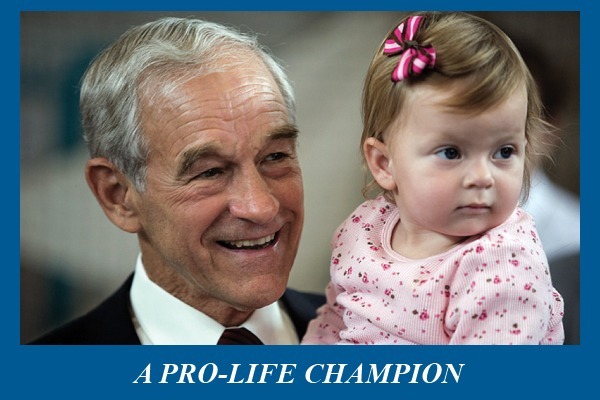 If human life is so sacred, where do you stand on those issues, Ron Paul? So, friend, no.. Ron Paul is pretty much just like all of the other closed-minded buttcheeses. I don't like you Ron Paul.